WHILE the tiniest film fans might be put off by the peril in which its characters occasionally find themselves, the splendid comedy “Inside Out” offers all others outstanding entertainment founded on strong values. With this clever story of a hockey-loving 11-year-old girl named Riley (voice of Kaitlyn Dias), the folks at Pixar manage, once again, to make a hat-trick – scoring for parents, youngsters and, quite likely, theatre operators. The set-up for their unerring slap shot is a familiar story enlivened by an ingenious approach. When happy-go-lucky Riley’s life is disrupted by a career change for her dad (voice of Kyle MacLachlan) that requires her family to relocate from Minnesota to San Francisco, Riley’s personified emotions – principally Joy (voice of Amy Poehler) and Sadness (voiced by Phyllis Smith) – struggle to help her cope with the resulting crisis. Despite some predictable tensions – stand-up comedian Lewis Black has a field day venting as Riley’s Anger – this is anything but the portrait of yet another dysfunctional family. In contrast to so many adults encountered at the cineplex, Riley’s parents (Diane Lane voices her mum) prove to be both caring and wise. Additionally, glimpses inside Ma and Pa’s heads – paralleling our sustained view of Riley’s psyche – show us the makings of a resilient marriage, even if these are illustrated ironically. A lesson about sacrificial love is also included in the proceedings via the actions of Riley’s big-hearted imaginary friend Bing Bong (voice of Richard Kind). Kind’s evocatively vulnerable performance drives home the poignancy of Bing Bong’s fading relationship with the maturing Riley as well as the stoic forbearance he shows in response to his lessening role. Aided by such top-notch turns, co-directors Pete Docter (who also had a hand in penning the script) and Ronaldo Del Carmen prove equally deft at tickling viewers and touching them. Along with the hazards mentioned above, only a joke about Riley’s impending encounter with puberty makes their picture suitable for a wide-ranging, rather than universal, audience. The film contains a few potentially upsetting incidents and a single mature reference. 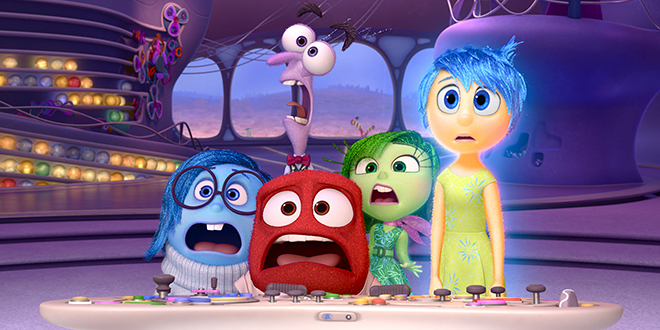 Name the feeling: In a scene from the movie Inside Out are (from left) Sadness, Fear, Anger, Disgust and Joy.